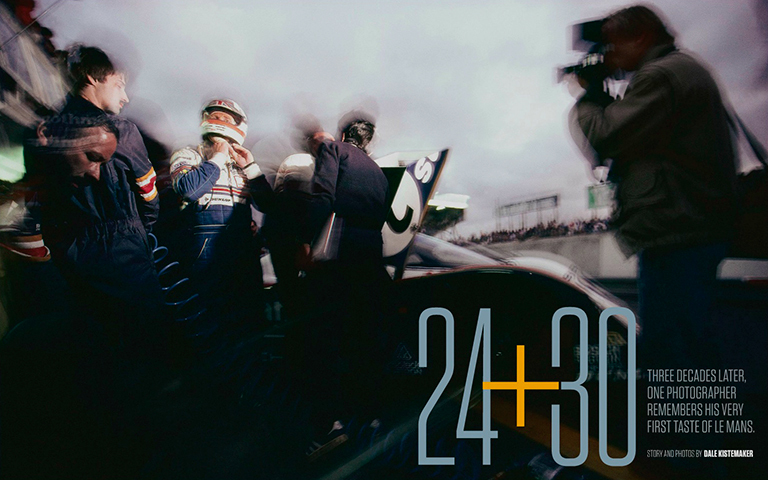 This is the beginning of 12 pages of my photographs and writing about my experiences at the 24 Hours of Le Mans 1984 -1985 published in the December issue of Panorama, the Porsche Club of America’s monthly magazine https://www.pca.org/panorama/edition/panorama-december-2014. I am extremely grateful for this opportunity and my heartfelt thanks go to Panorama’s Editor, Pete Stout, Creative Director Richard M. Baron, Associate Managing Editor Emma Ramshaw, and the staff at Panorama. Pete had been editor for 15 years of the highly respected “Excellence – The Magazine about Porsche,” where he established an extraordinary reputation for high quality, knowledgable work. He was appointed as editor of Panorama when Betty Jo Turner, who had guided the magazine for 42+ years, retired. This article gave me the chance to work with Richard M. Baron http://richardmbarondesign.com again. In the mid 1980’s I was freelancing my Formula One and Le Mans photography and he was Art Director at “Road & Track” magazine and published many of my photographs. Pete and Richard collaborated on the PCA Panorama’s re-design that resulted in a larger format high quality magazine that premiered July 2013. Because Panorama is not a newsstand periodical there is a freedom of design reflected in Richard’s elegant poster-like front covers and the expansive, aesthetically pleasing layouts of the articles. A 12 month subscription to Panorama https://www.pca.org is one of the numerous benefits of a PCA membership. I have been reading automobile magazines since I was a boy. I still subscribe to six car magazines and read several more each month as newsstand purchases. Despite untold hours pursuing automotive content on the internet there is something unique and sensory about a magazine that I find satisfying. I can hold it in my hands, feel the tactile smoothness of its paper and revel in the detail of its photographs while savoring every word of a well written story. I rank Panorama at the top of my favorite publications. While it contains the latest Porsche news, club activities and a great Porsche classifieds section I think of it more as an art journal with in depth features about Porsche history, cars, technology, and people.